Canada Lawn Signs specializes in producing Coroplast yard signs for Canadian Businesses. Custom printed lawn signs are available with single-side or double-side printing, with or without wire stakes or wire stands. Check out our price lists for the best online prices. Full colour lawn signs are our most popular choice. Flatbed UV inkjet printing has brought the price down to nearly the same cost as a two colour sign! We also have custom shape cut options. This year we have added pages for 10mm coroplast signs, Real Estate Signs, Aluminum Composite "Dibond" signs, PolyEthylene Signs, & A-frame or Sidewalk Signs, or Sandwich boards - whatever you want to call those! In order to keep up with rapidy increasing demand, we invested in a second flatbed digital printer —doubling our production capacity. In 2013 we invested in state of the art digital cutting technology. Our new Zund G3 digital cutter enables us to offer SHAPE CUT coroplast lawn signs. 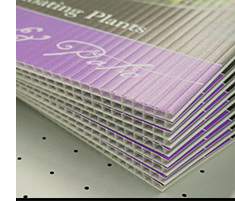 We can custom cut just about any shape out of coroplast. Shape cut yard signs give you a distinctive look that stands out from your competitors. We can trace the contours of your logo, or other attention getting shapes. The possibilities are limitless. In 2012 we invested in state of the art digital print technology, with a Fuji Acuity HS flatbed UV printer. This inkjet printer images full colour directly to coroplast sheets up to 4ft x 8ft. Now we can offer full colour coroplast yard signs at lower prices than before. No need to seek out low prices across the border, when you can buy Canadian. Our digital printer is capable of photographic output and has a very high colour gamut, enabling us to succefully match many pantone and other spot colour standards. Unlike earlier versions of this technology, you will not see ink spray, artifacting or distracting scan lines in the image. We do not run our equipment at speeds that compromise image quality and brightness — a common complaint we have heard from customers who had previously sourced their full colour signs south of the border.